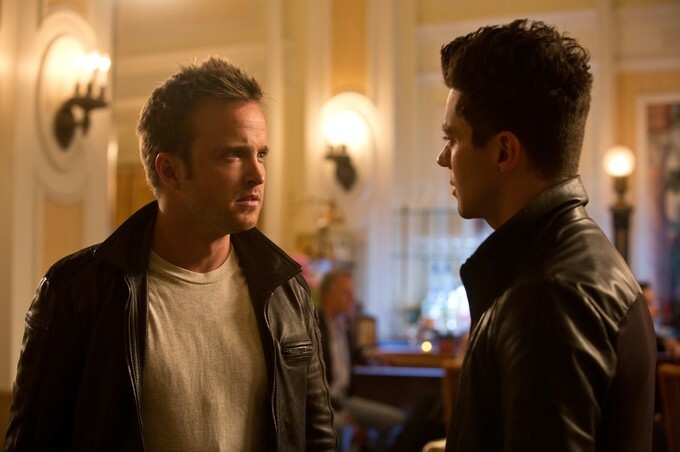 Capone drives full throttle talking to NEED FOR SPEED lead Aaron Paul and director Scott Waugh!!! As you may recall from my set visit report, I visited the set of NEED FOR SPEED last summer in Detroit, and got a chance to watch a high-speed, two-car chase take place on the streets of the Motor City about a dozen times. It was a first as far as stuff I've seen on a set visit, and in between takes we got a chance to speak to many of the cast and crew, including director Scott Waugh (ACTOR OF VALOR) and lead actor Aaron Paul ("Breaking Bad," SMASHED, THE LAST HOUSE ON THE LEFT remake), both of whom recently came to Chicago to promote the film, based on the popular video game series. Now free from his television commitment, Paul is poised to be a massive force in the film world, with many titles already in the can, including the excellent upcoming Sundance hit HELLION; A LONG WAY DOWN, based on the Nick Hornby novel; and Ridley Scott Moses tale EXODUS, starring Christian Bale, as well as the recently announced latest work from John Hillcoat TRIPLE NINE, with an impressive cast including Chiwetel Ejiofor and Kate Winslet, among others. Capone: Hey, Aaron. I’m Steve. 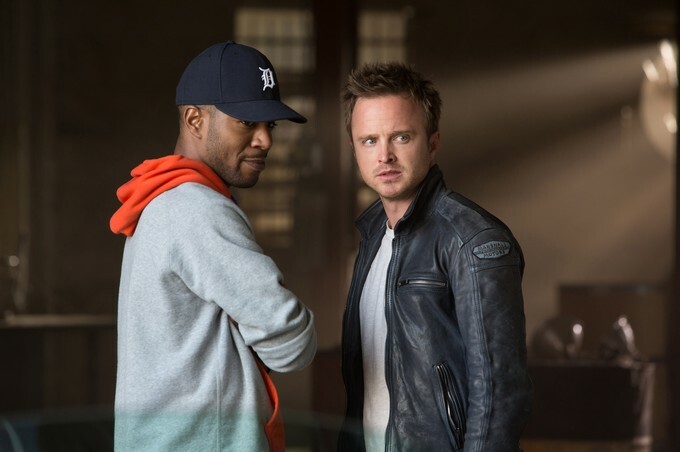 Aaron Paul: Hey Steve. How are you? Capone: How are you Scott? I was actually on the set in Detroit last year when all the online guys came. Scott Waugh: Oh, yeah man. I totally remember you, yeah. Capone: I remember half the questions for Aaron that day were "Breaking Bad" finale questions because it hadn’t finished yet, so everyone was real curious to get no answer from you on that. SW: He was good, trust me. I couldn't get an answer out of him. AP: Yeah, I didn’t. And the thing is, no one wanted the answers. They would ask, and then finally when I would start to just pretend like I was going to answer them, they'd tell me to stop. SW: He was actually good at screwing with people. He knows I definitely didn’t want the answer, and he sent me a picture and did like a practical joke. He was like, “Oh, I wasn’t supposed to send that to you. Don’t tell anybody.” And it was a very descriptive picture that would have been a different ending. AP: Yeah, it was like me all bloodied up. SW: You and Brian. It was like they both get completely annihilated. AP: Yeah, it was a photo from like an Entertainment Weekly shoot. Capone: What I kept thinking while I was watching the movie was that Tobey [Paul's character] is one of those guys who can’t get a break. Everything is going wrong with him in every aspect of his life. He’s just surrounded by death and hardship. But when he’s behind the wheel of a car, that’s the one place he feels like he’s under control and has got it together to a certain degree. SW: That’s super preceptive of you, and I’ll tell you why. I was telling Aaron this, I still race Motocross. I just do it for fun now,and one of the primary reasons is it’s the only time in my life when I can’t think of anything else. You have to have such a focus that all your trials and tribulations that you’re going through are completely on the wayside, and you’re just at 100 percent, which is really complicated for men, to have 100 percent focus. That really was Tobey Marshall. He had so much stuff going on in his life, but when he drives, he’s alive. AP: That’s the one place where he truly feels comfortable and somewhat at peace. He lives and breathes cars; he was born into it. That’s what his father loved. He loves all aspects of cars, and that’s the one place he feels safe in a way, even though he’s doing such dangerous things, but he just feels comfortable there. Capone: The code that he and his crew live by, it’s very military in its nature. "Never leave a man behind." Can you talk about the idea of loyalty in the film. SW: I think there’s a common theme like that in racing as well, and more so actually in the Dakar Baja 1000 off-road world, where you’re a family even though you’re against each other. Because when you get out in the middle of the desert, and you’re hundreds of miles away from everyone, if you go down, you’re only at the mercy of your fellow racers. When you’re racing down there, you stop, even if you’re running second and the first-place guy breaks down and has a big accident, the second-place guy doesn’t go, “Yay, I’m going in front.” He stops because you’ve got to help the guy. You’re a family when you race. Capone: Yeah. I remember when we were on the set, and there was a lot of discussion among everybody about the love of '70s car movie culture. Now that I’ve seen the film, I realize you’re not saying new cars have no place in the world, because it actually ends up being the modern cars that dominate the final race. SW: Well, I was so lucky I grew up with my father being a stuntman, and I was on the se. I still think some of the greatest car movies of all time are still VANISHING POINT, SMOKEY AND THE BANDIT, and BULLET, and there was an essence to those movies that was raw, real, no CG, and motor noise--not a music montage. And we wanted to pay respect to that world but make it contemporary, so it doesn’t feel like we’re making a movie in the '60s or '70s. We wanted to make it modern, and that meant trying to stay true to that type of genre of car movies but really take it to the next level of making it more immersive, which is putting the camera in places that they couldn’t back then, or in places that for me being an ex-stuntman, I wanted to put the audience in those shoes that I’ve been so lucky enough to have seen. So that meant first-person driving. Putting cameras in those spots so you physically sweat and feel what it’s like to be a racer going those speeds. Capone: You say ex-stuntman, but I heard some stories about you grabbing the camera and putting yourself in some places where you wouldn’t feel safe putting your cameraman. SW: Well, I’m not on a SAG contract during those shots, so that means I can’t still be a stuntman. Yeah, I don’t know. I get this kid in me when I want to get this particular angle or shot for my audience that I’ll go to the nth degree to get it, and I don't care. When Scott Mescudi [a.k.a. Kid Cudi, who co-stars in the film] is flying the helicopter down the middle of Detroit, I talked to Shane [Hurlbut, director of photography] and was like, “I want the camera here.” That’s the only place we could do it. We couldn't mount a camera on the exterior of the helicopter, and I was like, “Well, I’ll just stand on the skids and shoot it.” And it wasn't like being stupid, I personally needed that shot. Capone: DUEL, SUGARLAND EXPRESS, and you're here in Chicago of course, so THE BLUES BROTHERS, which Spielberg has a cameo in. SW: Still have the record of the most cars wrecked ever. Here’s the greatest thing about Spielberg. They came to me; I didn’t go to them. And I think you nailed it on the head, because he really wanted to make a movie that was no CG and how he made his movies back then, and he knew I was that type of filmmaker, because when I came in the room it wasn’t like I had to pitch that concept. He knew like what I was going to pitch him. Capone: You mentioned before about your dad and yourself being stuntmen. In a way, was this film a tribute to the stuntmen you grew up around? SW: Oh yeah. My dad passed away right before we started making the movie, and in my eyes, I’m biased, but I think he was one of the greatest stuntmen ever. The movie is in memory of him. And I think that the stuntmen of the old were the real cowboys. They really were. They didn’t have the luxury of technology that we do today--there wasn’t CG, there weren’t wires, there wasn’t any of those things. They really did everything for real, and they payed the price for it. So, even modern-day stuntmen still know that the old-school stuntmen really defined the work. Capone: Watching the Oscars the other day, I saw Hal Needham's face in the In Memoriam clips. He had to be a huge part of your life. SW: He was my dad’s best friend. I grew up with Hal my whole life. I’ll put it to you this way, when my dad passed away, at my dad’s celebration of his life, which I guess technically is still a funeral but we call it a celebration, Hal showed up and came to me and said, “You know, kid, I’ve only been to two funerals in my life, because I hate these damn things, and your dad’s my second one.” And I was like, wow. He really had that special light. I used to talk to my dad about him, and Hal, he was the king. And my dad used to say one thing to me all the time: Hal Needham is the toughest man he’s ever been around. They would do these horse-saddle falls, break four ribs, and still keep going. He just had no pain threshold. Capone: Aaron, how much actual driving did you do and how much more could you have done with the training they gave you? SW: He actually could have. AP: No, I signed onto this project when we had a good three, three-and-a-half months out before we started shooting, so I was just on the track as often as I could be. I was just about to start shooting the final season of ["Breaking Bad"], and so in my off time whenever I had some days off, I’d come back to LA, jump onto the track at Willow Springs, and just really learn how to stunt drive, really control the car in a way that I never knew how to before. Just sliding it around corners, driving it in reverse at very high speeds, reverse 180s or 360s. That said, we had the best stuntmen on the planet working on this film. His best friends since he was born. He’s a second-generation stunt man, our stunt coordinator was third-generation stuntman. AP: So with that said, they were really doing the heavy lifting when it came to the dangerous stunts. I did do a lot of my driving. I did some of my own stunts. The first race in the film, the Mount Kisco race, where Tobey was flying around in the Gran Torino, that I did. I feel like I did most of that. I think that’s why I love that car so much; that’s my favorite car in the film, because they really let me go crazy with that thing all around Macon, Georgia. It was incredible. Capone: When you hear that you have to do this cross-country trip with a woman in the car with you, the cliché mind starts working overtime, but Imogen really adds something to this. And you had just made a movie with her, right? I’ve seen the trailer for A LONG WAY DOWN. Did you bring her in because you liked working with her? AP: That was all this guy [points to Scott]. When they approached me for this project, we were shooting that movie in London, A LONG WAY DOWN, and I read the script. I was really surprised that I loved it so much, to be honest. I was hesitant to even start flipping through the pages, but then I instantly fell for these characters; I was invested in these characters. When we started talking about casting, he said, “Our top choice, the girl that keeps making it to the top of the list, is a girl that you’re actually working with right now, randomly.” It was just like by chance. And I thought to myself well, that’s fantastic because I love Emmy. We had such an incredible experience on that movie, and the idea of being stuck in a car with her was great. It was nice to know that I really got along with this girl. When she decided to sign on, we were all excited. SW: I called him because Steven pitched me Emmy, because they had used her in FRIGHT NIGHT, and I had looked at a lot of other films that she had done, and she’s so talented as an actress, and I could tell she has a really good, strong personality. I was like, these two together in a car could be really volatile, which is what we were looking for, and then when I found out she was in his movie I was so upset [laughs]. And I was like, “Hey, I know Imogen Poots is working with you right now. Is she playing your love interest? Because if so, that’s catastrophic.” And he’s like, “No, no, no. We're two characters in a movie; we’re not actually love interests.” So it was like, okay. Capone: I think I’m seeing her next week down in Austin for SXSW. She’s down there for her Jimi Hendrix movie. I know HELLION is there. Are you coming down for that? AP: HELLION is there, but I sadly can’t make it on this tour. Capone: I think I’m talking to [director] Kat Candler. AP: Oh yeah, everyone's going to be there. Capone: That's a great movie by the way. I just saw it. AP: Oh, did you see HELLION? It’s a special, beautiful film, and Josh Wiggins is phenomenal. Send them my love. Capone: What was the most dangerous thing you guys did in this movie? I’ve got to imagine that grasshopper thing was right up there. I can’t believe you pulled that one off. SW: The grasshopper! My father and that generation have been jumping cars for a long time. You think "Dukes of Hazzard." Capone: That’s what that looked like. That’s exactly what came to mind. SW: Right? So the ingenuity behind that really was set by our predecessors--Lance’s dad and my dad. So, it was a mathematical equation that took us a while to figure out, and that’s really all that stunt work really is. So, there’s a high level of danger to it, but it wasn’t something that hadn’t been out of the box. Capone: It’s just geometry and physics. SW: It’s a total geometry, it’s totally physics. Hit the pitch of the ramp at this speed, at this height, and you’re going to go this far. Capone: It looked like a longer jump than the typical "Dukes of Hazzard" jump. SW: Yeah, it was only 70 feet. But the downramp, that’s where the mathematical equation comes in, and he had about an 8-foot window that he had to hit that down ramp. So if he undershot it or overshot it, we knew the car was going to explode. So he needed to preserve the car because it’s in the movie and he needs to keep driving it. So, yeah that was one. But I think the biggest one that had never been done before was the helicopter catching the Mustang. That was something that was definitely…this is 2,000 feet up, and there are a lot of repercussions behind it. That one for me, I had a lot at stake on that one. SW: Lance and I, we both wanted to ride the car off the cliff. SW: Lance and I have always taken that with us, the camaraderie that our fathers had together, and we thought what a cool way to pay homage to my dad and do it together. But, the studio didn’t think that was a good idea. Capone: You do a great job of incorporating ideas from the video game with just a chase movie that for people who don’t know the video game, they don’t need to know that. SW: Right, they don’t need to know that. Capone: Much like video games, you could do more of these if you wanted to. Is that a thought? SW: The way we look at it is, if the audience wanted more, we’d be tickled to do more, because we had a great time making it. AP: It wasn’t fair. We had so much fun. I got a glimpse inside of this guy’s world for just a moment, inside of this stunt world. He was just surrounded by his best friends and it was just so apparent why they do what they do. They’re just big kids playing with big toys and having the best time doing it. It was such a blast. So yeah, if the audience wants more, I know we would jump at the opportunity to do it for sure. Capone: Cool. Thank you so much, gents. AP: Great to see you again.